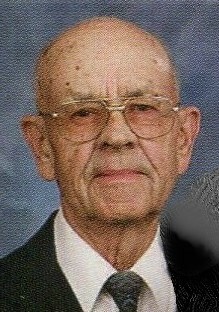 LeRoy Walmar Wangerin, age 91, of Wautoma, passed away Wednesday evening, January 30, 2019 at Heartland House in Wautoma. He was born March 8, 1927 in West Bloomfield, the son of Friedrich Herrmann Auguste and Ella Martha Augusta (Radichel) Wangerin. He was made a child of God through baptism later that year and pledged his lifelong faithfulness to his Savior Jesus at his confirmation on March 17, 1940. He married Violet Viola Lippert on June 19, 1948 at Emmaus Evangelical Lutheran Church in Poy Sippi. In early adulthood, LeRoy picked up eggs from local farmers in the Fremont-Weyauwega area for processing. He then farmed in rural Fremont and also operated a milk route for White House Milk in Winneconne. Later, he was employed as a porcelain sprayer at Speed Queen Corp. In the years before retirement, LeRoy served as dorm supervisor at East Fork Lutheran High School in Arizona. LeRoy’s faith in Jesus as his Savior was apparent to all who knew him. His family is grateful to have learned from him all Jesus has done to give them eternal life in heaven. LeRoy used his God-given gifts to help others throughout his life. He often helped his children and grandchildren repair and remodel their homes. He built furniture for them. In retirement, he and his wife volunteered for Builders for Christ, building churches all over the U.S. He enjoyed working crossword puzzles, working with wood, and repairing machinery. He was known for telling stories and jokes to friends and family. He is survived by his wife Violet Wangerin, Wautoma; three daughters, Sharon (Rev. James) Aderman, Greenfield, Jean Retz, Wautoma, Judy (Randall) Pahl, Wisconsin Rapids; eight grandchildren; 18 great grandchildren; He is further survived by nieces, nephews, other relatives and friends. LeRoy was preceded in death by his parents; his son, Mykel LeRoy Wangerin; his great grandson, Xander Aaron Mayes, his sisters, Alice Mach and Stella Warnke, and his brother, Gerhard Wangerin. Funeral services will be held on Saturday, February 2, 2019 at 1:00 p.m. at Peace Lutheran Church in Wautoma with Rev. Joel Suckow officiating. Burial will be at Concordia Cemetery, West Bloomfield. Visitation will be held on Saturday at the Church from 11:30 a.m. until the time of services. In lieu of flowers, memorials for Peace Lutheran Church or Builders for Christ are appreciated.